Apparently, this reporter got wind of the spinning and knitting class I was to teach at Old Economy Village, and decided it sounded interesting enough for an article. The whole experience was a little surreal – she came to school and interviewed me during my lunch break, sitting in the couch area we affectionately call the “jungle.” I completely forgot the appointment set with the photographer, so when she turned up the house was a total wreck. She was very nice though, and after some doing found an angle that didn’t include a bunch of crap in the background and that mostly hid my unfortunate hair day. The surprise was how many people read it. It was published only two days before the class, but two more people signed up because of it, which made the difference in OEV being able to profit a little off the venture. People keep turning up at the shop saying “I saw you in the paper!” I’m glad so many people still buy and read their local rag; it would never occur to me. The whole article experience has made me reflect on the fact that I didn’t really think of my life as interesting. I am the sort of person who is always looking for new and interesting experiences, with my eyes on what’s coming next and what’s ahead. I’m not very good at living in the moment and really savoring what I’m doing right now. So it’s good to be arrested by this process and say, you know what, I’ve worked really hard for a long time at this whole fiber arts thing, and it’s a huge part of my life that I really enjoy. I still don’t know where it’s going or how it will fit into the rest of our calling. But for goodness sake, while I have the chance to earn a bit of our living by teaching classes, knitting commissions, and publishing patterns, I jolly well ought to enjoy it. The class, by the way, went great! 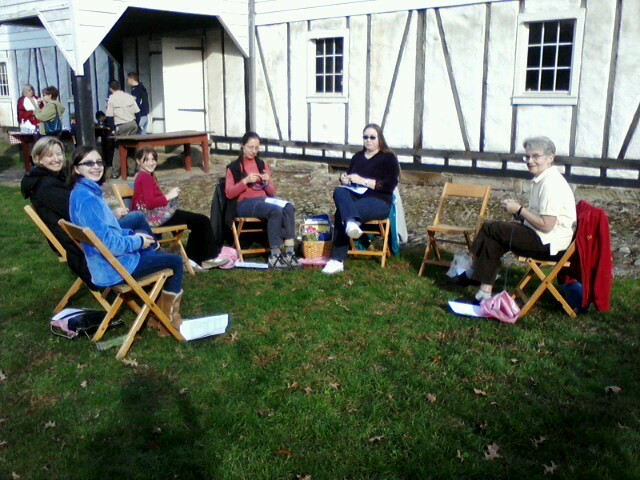 All six ladies knew how to knit already, so we spent most of the day focused on spinning. The morning was all drop spindles, all the time. This picture is from a brief period after lunch, during which I demanded that we move out to the yard since it was so impossibly warm. We spent more than half the afternoon playing with two spinning wheels that I brought with me. It was over before I knew it, and everyone did a great job. We were all so focused and working hard that it was hard to tell if everyone was having fun, but I did. Hey, Rebecca! I don’t think I said it on Saturday, so I’ll take advantage of the opportunity here to just say thank you so much for teaching the workshop. (And you needn’t wonder. It was a lot of fun!) I was having so much fun, in fact, that I completely forgot to take pictures, and that NEVER happens! 😦 The only shots I took were of my spindle loaded up with my 1st attempt at yarn. I blame you for that, and for the fact that I have been trolling the web ever since pricing spinning wheels. And roving. Hey, I enjoyed the article! Good opportunity for you! I sort of wish the article had more “flavor-text” as Greg would say. Personally, I think you are amazing!